-Thus it came to pass that the day the planet was to die was upon them, and there was no escape. We have been trained to think within the box’s four sided, top and bottom constraints. About the time I went to school, there were whisperings that a guy named Leif may have come to America before Columbus. But it was still gospel that in 1492 the Old World discovered the New World and its people. We are still taught the New World’s people came to this continent via a long vanished land bridge in Alaska. And so, tests were designed, grades were determined, and to pass school, we were indoctrinated into these beliefs. Perhaps you have heard that in Keuka, New York there were remains of an ancient settlement? Those remains have been erased and are sadly gone now forever. There are over 800 known ancient sites existing in the New England area of which -nothing- is ever said. There are an assortment of dolmens, menhirs, henges, and stone chambers all of which are strikingly similar to those found in the UK and Europe. In fact, some of these stones have writing on them in the Gaelic alphabet, Ogham, as shown above. (Stone has fallen over.) Just a few miles from Boston is a 30 acre site. I have driven past another site for years and was totally unaware of its existence. If you dig deep enough in the literature and the internet (no need for a real shovel) you can find information on some of these sites. Few, if any, are protected except by diligent landowners. The possibility that they will vanish forever like the Keuka site is very real. Our very ancient world history is in jeopardy. These sites are in addition to the massive array of ground works built by the Hopewell and Adena Indians that span the better part of North America. (By the way, the name Hopewell sounds English because it is the last name of a property owner upon which a group of mounds sat. The name Adena has a similar beginning.) We are taught today that they were ignorant natives that scooped up dirt in baskets and dropped it in places to build random piles. We are told they are of relatively recent origin (800 to 1000 AD) and probably built for burial purposes. 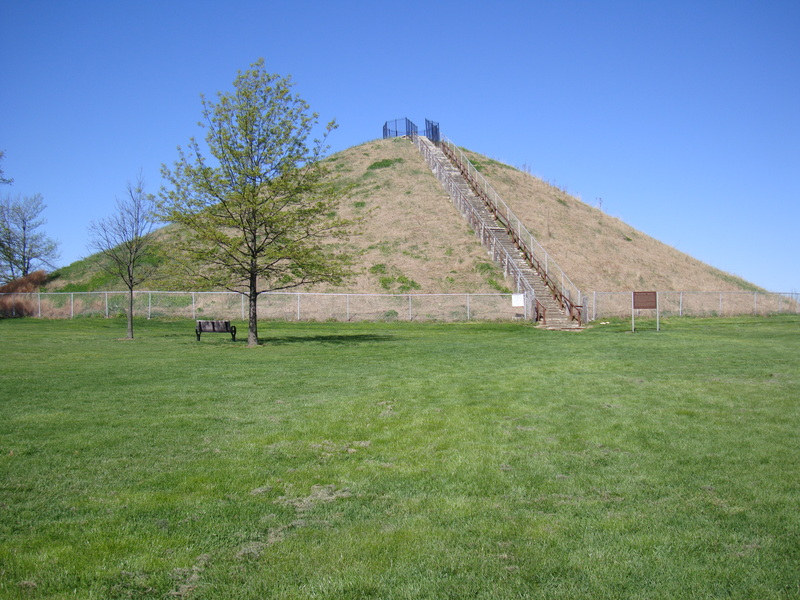 Miamisburg Mound, Ohio is shown in the picture as it appears today in 2012. The view is spectacular from the top. From this vantage point there is unlimited visibility and directed light can be seen for miles upon miles. 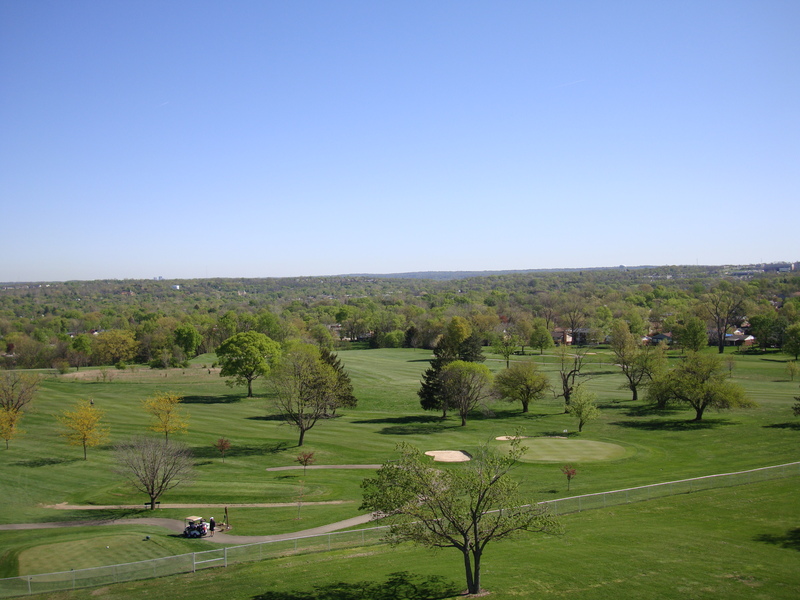 The view shown here is towards the southeast looking in the direction of the Great Serpent Mound which is now an Ohio State park. 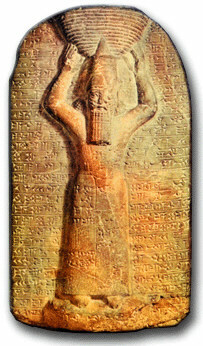 Ashurbanipal as High Priest, Wikimedia, Pub Dom. Perhaps this is one of the simple basket carrying people that helped to build the mounds in North America? Perhaps King Ashurbanipal (668 BC-626 BC) helped to build them. Here he carries a basket of soil to contribute to the rebuilding of a temple in Ancient Iraq. I am giving you this background and posing these questions so that as we discuss the New Hampshire Mystery Stone you will understand this stone did not just appear from nowhere. It simply cannot be a hoax. It may have been stolen from the artist and hidden, but nothing this beautiful gets tossed carelessly away. It is more likely that it was a water burial of a great noble person which allowed the stone to end up in Lake Winnipesaukee, New Hampshire and eventually buried near its shore. The information on the stone is very old and forgotten by us, and even the Native Peoples, to be of recent origin. The message of this stone is not “a lone voice in the wilderness crying out.” This stone is a beautifully rendered version of a message that has echoed across the ages. It is an incredibly important message that is about to reverberate clearly again. Once you understand the message it becomes understandable why our ancestors built these monuments, and so very, very unclear as to how we managed to forget so dreadfully much. To continue to stay within the box is to cheat ourselves. Just because our education does not allow for any of these possibilities, does not mean they are not true. One must step out of the box just long enough to hear the message of the Mystery Stone. There is plenty of time to jump back in to its small confines afterwards. 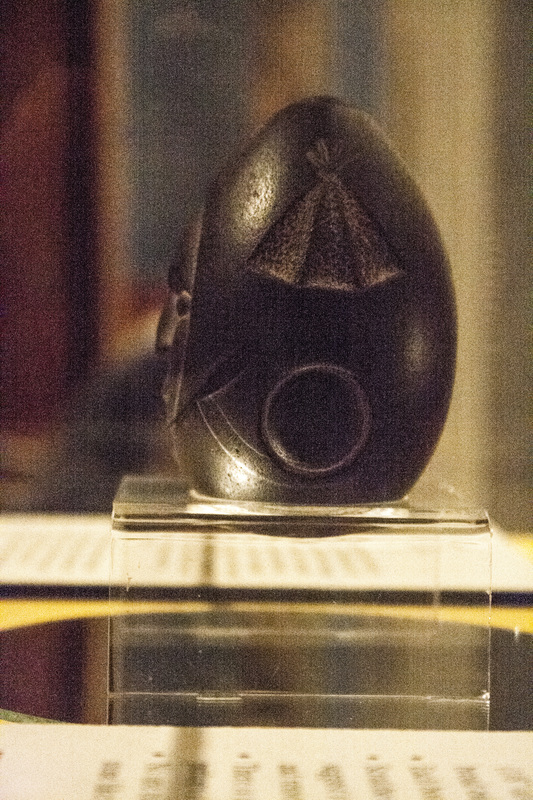 This small artifact is on display in the New Hampshire Historical Society in Concord. Found in 1872 near Lake Winnipesaukee, its origin remains unclear. Its meaning alludes traditional translation. The only explanation for its symbols and purpose that I have found is that it represented a treaty between two tribes. The first time I saw it, this explanation was satisfactory. Sometime ago I had another look at it and I had the same impression. It was the ear of corn and the indiscernible shapes in the circle beneath it that kept making me think this must be a relatively recent tribal object. 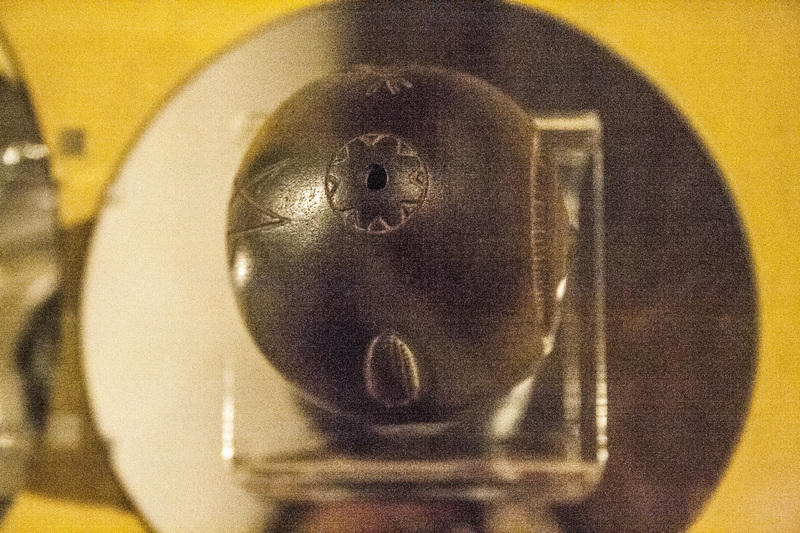 I now think this is incredibly old and an object once owned by a High Priest, King, or Queen of great importance. It was that same simple ear of corn that finally made me exclaim in awe as it yielded up the stone’s secret. Tent side of New Hampshire Mystery Stone, photo B. Freeborn, Public Domain. A study of this artifact proves it to be a truly magnificent and complicated work of art. It contains information privy to only a few persons in the Old World. This small harmless looking stone is of a noble nature and its message is vastly important. It is a mere 4 inches in height and has a diameter of only 2 ½ inches. Onto this small surface ten images are carefully carved. The stone is made of quartzite or mylonite. The surface is smooth and polished. If it was a naturally occurring stone that was utilized by the artist, then he was fortunate in his find and with his skill. The art is flawless except for a chip near the forehead of more recent appearance. The work is intricate and detailed. The proportions are perfect for the message, so if the artist had faltered he would have had to find another stone of equal ellipsoid perfection. 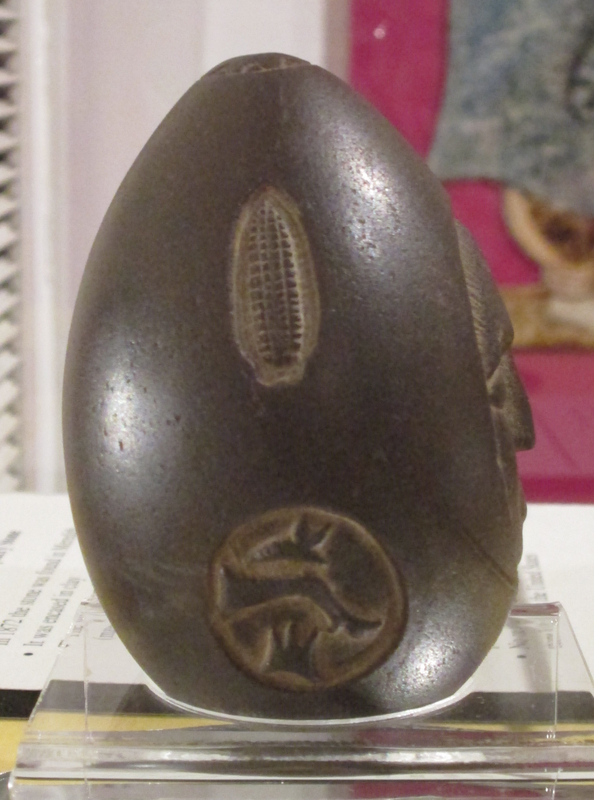 This suggests the stone was turned and then polished to the desired proportions. The fact that it was probably turned leads most experts to quickly conclude it is of 19th century origin. This would be thinking only within the known context of our accepted knowledge of history. Consider that we cannot explain the construction methods of some of the oldest sites to be found in the world. The debate as to how the Great Pyramids were built still rages. The explanation as to how stones can be cut and fit as perfectly as they are at Machu-Picchu alludes us. Into this class falls this perfectly cut stone. The idea that it is 19th century is problematic to start. This was first machined before it was decorated. The symbolism is of tents, corn and arrows. Hence, we quickly conclude it was not colonial in nature but tribal. How many tribes had lathes or turning equipment? So then we conclude it is early American art of a unique nature. But that does not seem either satisfactory or logical. If the symbolism could be understood, then we might understand its origin. On the front panel a large face is cut. On its left side are 2 small symbols, on its rear are 3 and on its right are 2. This comprises 7 small images. On its top is a circle with 8 triangles and a 1/8 th inch bore hole. On the bottom is a circle with 8 triangles tacked on. There is a 3/8 inch bore hole in the bottom. This then creates 10 images upon the stone. Its circumference calculates to 7.9 inches. The layout appears in the sketch. Layout of images on New Hampshire Mystery Stone, B. Freeborn, Pub Dom. The square root of 12321 is? And 111 can be said to represent God. Consider that there are 7 images in the back grouping which reaffirms the special number 7. Add to this the two images on top/bottom and obtain 9. And then the face makes ten or we have these numbers in series 7, 9, 10 or 7910. The circumference of the object is 7.9 inches. We know this number today as the diameter of the Earth at 7920 miles. This object is an oblate sphere. The Earth is an oblate sphere. This object has circular areas on the top and the bottom just as Earth has circular areas on the top and bottom called the polar ice caps. The array of seven scenes if read as rows becomes a series of numbers: 3, 3, 1 or we might say 33.1. This number represents an important concept I explain in numerous posts in the future. It represents an extremely significant idea portrayed repeatedly in the Ancient World. It is easy to imagine the person depicted lived in a cold climate since it appears he is wearing a hood. This is emphasized by two small etched lines as if there are shoulders shown below the face. So the place from which this came was likely cold. The face is serene and silent, almost sad. It is beautiful and perfect in its proportions. Is this not a statement that says, “We were a beautiful and contemplative people” ? The images on the top and bottom are circles with 8 triangles each. They appear as shown in the cropped images. 8 is an interesting number. It can be said to be 2³ and this always make me think of infinity: doubling, doubling, doubling in all directions. When the 8 triangles from the top and bottom are added together it sums to 16. The Earth moves at the rate of 66,624 miles per hour and so in any given day it moves nearly 1600,000 miles around the sun. The world tirelessly turns and turns rotating the heavens around us. It turns like two enmeshed gears. 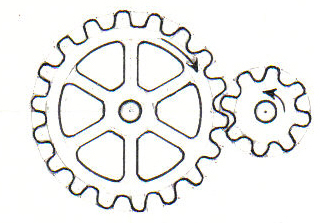 If the two images are put together a gear assembly is created. Recall the group of seven images plus the two on top/bottom create the number 79. They can just as easily be arranged as 7 and 2 to create the number 72. The rate at which the pole star precesses is one degree per 72 years. The overall length of the stone is 4 inches and its width is 2 ½ inches. 4 / 2.5 = 1.6. Here appears the 16 again. The distance Earth moves in a day is 1600,000 miles. And continuing the idea that the oblate sphere represents the Earth, is there not a large white polar ice cap at each pole? A line through the pole points to the pole star. This stone had a hole in its top and bottom so that a thin staff/pole can be inserted in the bottom and another thin pole can be inserted out of the top. This creates a planet with two ice caps, a pole, and a reminder of the rate of precession of the pole star. Summing up so far, our stone tells us we have a contemplative people who lived on a planet 7910 miles in diameter that turned at a fixed rate. Cogwheel by Pearson Scott Foresman, Wikimedia, Pub Dom. I suggest the grouping of seven images on the back and sides of the stone should be read top to bottom, left to right. So we begin with the first image on the left of the face which is the Tepee or tent. 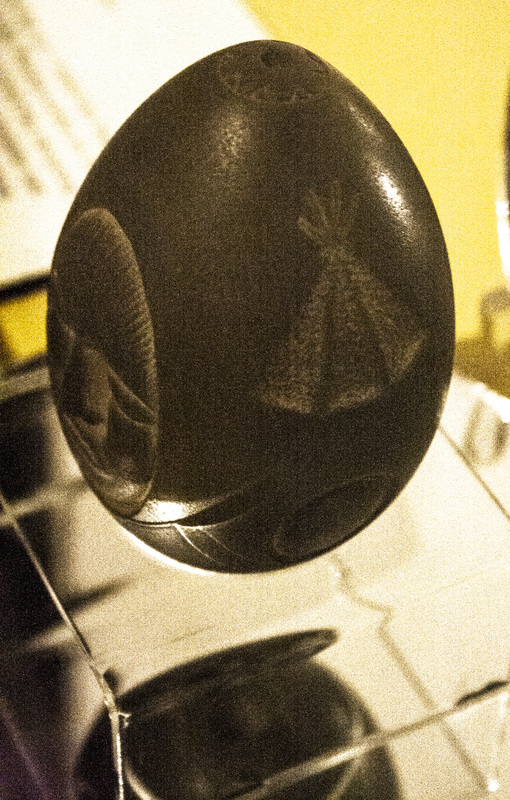 Upon visiting the museum and seeing the Mystery Stone, we were told by the staff that it probably came from out west because the Plain’s Indians lived in tepees of the style depicted. This is difficult to argue except that does not preclude other people at other times living in the same style of structures. In fact, the style of tent is not exactly all that unique. It appears in Egypt both historically and presently. It is a style that gives an economy of form and materials. To limit it to one single group of people in a particular time period is excessively restrictive. In fact, the Cherokee tribe is originally from the St. Lawrence and South Carolina areas which means it is not solely a style found in the plains but just as common as the idea of a house with four walls. We let the argument linger as to when and where, and continue on with the study. We shall call the image a home because that is more meaningful. Home is where we all live. This home has three panels shown so we might assume it is made of six panels. 6 reminds us of the number of minutes that create an hour and seconds in an hour. From the top projects four stakes. We could say they represent the four corners of the world, or 4 x 6 equals 24 hours in a day. Between the three panels lies 2 distinct lines. So, we have a series of numbers again: 4 3 2 shown by one half of the home. We might take a leap and say two halves would give us 864 and 864000 is the diameter of the Sun and exactly the number of seconds in a day is 86400. We might also say this home represents the measurement of the world from the pole. If a line fixed at the pole sweeps out we obtain lines of longitude, just as portrayed by the tent. The tent measures 90 degrees. Each panel measures 30 degrees. Thirty degrees is what is called a double hour in longitude. We call every 15 degrees a different time zone. Now we look for the symbolism in the circle. At first I had attached negative connotations to it such as hole or abyss but then I considered its position beneath the tent. Looking only at the positive we find it can mean: wholeness, completeness, and perfection of form. The Moon is a perfect globe as is the Sun. The Earth is perfection. The planets move in circular orbits. In fact, they move in orbits similar to the ellipsoid form of the stone. Perhaps it then means life was perfect. Life was harmonious. Still, so far so good. – The eye cannot see what the mind cannot conceive. The image of crossed arrows that is almost a tepee appears in the center back. I like the phrase: the eye cannot see what the mind cannot conceive. That explains why we cannot understand what appears in this image. If it is arrows, they are arrows that have bounced because only two of them have heads. I suggest they are two images in one. They are first a set of dividers which are used to measure on maps, to inscribe circles and to measure the heavens. They represent the measurement of the Earth and Heavens. As a set of dividers, one must ask at what angle are they positioned? What angle did they want to preserve for posterity? It seems that they record an angle of 56 degrees at the main top and bottom intersection. The smaller angles (very difficult to measure from photos) at the bottom appear to be 35 left and 30 degrees on the right. The sum of 30 + 56 = 86 which reiterates the diameter of the sun at 86400 miles. The sum of 35 + 56 = 91 and 91 represents the Earth’s closest approach to the Sun at 91.4 million miles. The number 56 can be found four times in this small image by considering all the angles displayed. 56 – We discussed this number previously in the post about the 56 Aubrey Post Holes (June 2012) which have been found at Stonehenge in England. It is mysteriously always present yet not a word is ever said about it. It appears in the spelling of Yahweh. It appears and reappears, secretly, over and over. Before we leave the pattern formed by the crossing lines, notice that there are two large triangles created. This is another version of an often seen symbol. You have seen it most of your life in two forms. The symbolism appears as the Vesica Pisces which is created by the intersection of two circles. In this case the Vesica is split in two halves. The offsetting of the circles is shown by the two identical triangles. Placing a circle in a vesica creates the all seeing eye on a dollar bill, and the basic form was borrowed by the Christians to represent Christ in the symbol of the fish. The original meaning behind these symbols is of great importance and is explained in future posts. The second idea recorded here is very, very difficult for us to understand. Perhaps this image represents meteorites, or hard rain, as the ancients put it. A rain of pelting meteorites came. Sometimes ancient texts describe it as arrows falling. Arrows from heaven came. So far so good for the translation but the story has taken an odd turn. The next image is of the crescent moon and the crossed spears. 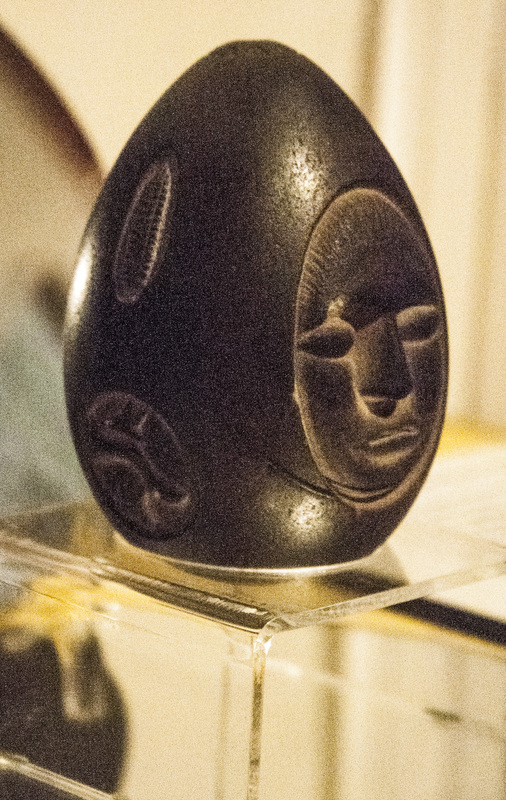 This is the image that has always made it very convincing this stone is about a treaty between two tribes. However logical that is, let us set it aside for the time being and reinterpret this image. Notice its position. It is centered within the seven images upon the back. It is the turning point of the story. Previously, we had “a rain of arrows” now we have something that looks like a truce. Could this indicate not only the turning point of the story but the final turning point for mankind? People have been slowly coming to this realization these last few decades. Something big and bad happened to our planet. We cannot figure out where, or when, or exactly what. Here we have it spelled out for us and we still cannot see it. I can only say we are not giving the subject justice in these brief paragraphs. In looking at this image we see it is formed by two lines that cross at 90 degrees. 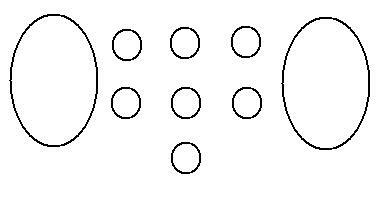 If we add the two dots to this we can obtain 90 + 2 = 92. And to what does the 92 refer? It is roughly the distance from the Earth to the Sun in millions of miles. It can also be looked at as 90,1, 1 for 91.2. The closest approach of the planet to the Sun is considered to be 91.4 million miles. It can also represent a time period. And how can one represent time with a cross? We have been doing it for a couple thousand years. The day Christ died is indicated by a cross. The date to which this image refers is also represented by a cross. Now to understand exactly what happened we need to study the image again. To read this symbol properly it should probably be inverted. Then one can see the shield is a crater. This is the impact of not one, but two comets. The two dots are also significant. There are numerous ancient drawings that display this two dot pattern just as the Great Serpent Mound in Ohio does. This is a record passed down to us from eyewitnesses. This is a record of two comets which impacted and formed craters. There are numerous comet craters that exist. The Pingualuit Crater in northern Canada is nearly perfect. Was this one of them? The Barringer Crater in Arizona is nearly perfect. Are these the two comet impacts or? Or! Or! Or were they just impacts of what they called “hard rain”? Did the craters they are referring to here dwarf these perfect craters? Were there people who survived these impacts? There are many other crater possibilities. In future posts I suggest there are specific craters to which this symbol refers. I discuss the age of these craters and others according to geologists. This, too, is a lengthy and interesting topic. 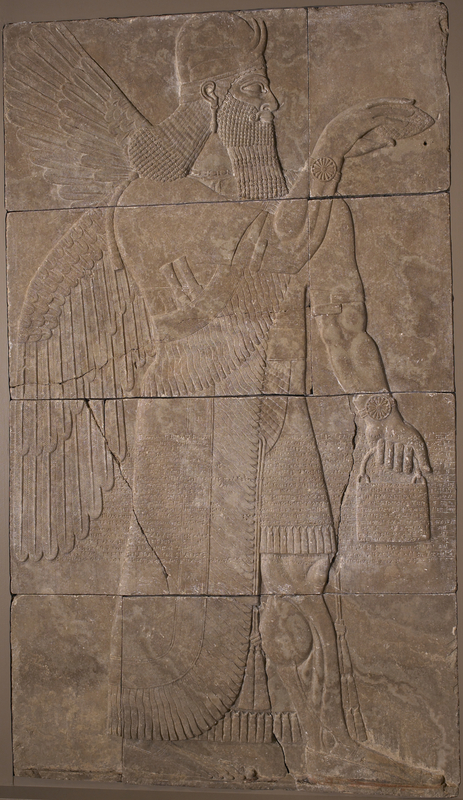 This image is a relief from Assyria (Calah in present day Iraq) of the Winged Genius. It is currently in the Walters Art Museum. Notice the cone shaped object in this Spirit’s right hand. The description file reads: The “benevolent spirit uses a cone-shaped object to sprinkle from his bucket some magic potion upon either a sacred tree or the king depicted on the adjacent relief.” If I might re-translate what this not-so-benevolent spirit is doing. He is sprinkling meteorites on the adjacent King and he has the ultimate weapon poised in the air – a comet. 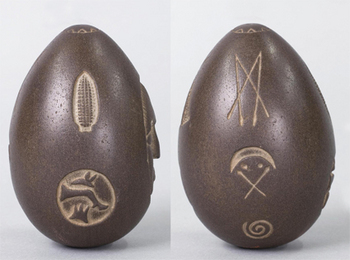 It is the cone shaped, egg shaped object that looks a whole lot like the New Hampshire Mystery Stone. He, as a giant, god, or Nephylim, is the force that guides the object. This relief is dated to 883 to 859 BC. 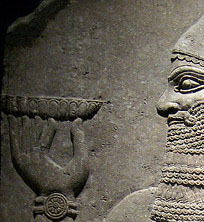 Detail of Cup depicted in Ashur-nasir-pal II Relief from Brooklyn Museum, photo by Wally Gobetz. There are other versions of this relief. In another, also from Iraq, is a nearly identical representation of the spirit except the man is portrayed as a bird. There are adjoining images which display a man carefully holding a flat cup which is a symbolic depiction of the crater. The detail images of the cone show it is similar in appearance to a pine cone or made of small pieces which is an accurate representation of many comets. We know now that comets are often made of large masses of ice crystals and rock adhered together. From other ancient sources we can determine that a comet came to Earth that broke into pieces. This idea is confirmed in this art. Two pieces struck the planet as shown here in this section of the Asshur or Ashur-nasir-pal II reliefs in the Brooklyn Museum. Between them lies what is called the tree of life but we might correctly call it the polar axis. In our small New Hampshire stone we have the same egg shape and a hole in the top of the stone for an axis. So, we have two comets approaching the polar axis. Two comets depicted in Ashur-nasir-pal II Relief from Brooklyn Museum, photo by Wally Gobetz. These comets came to choose who lived and died. The Cross (in the spear/shield image) tells us X marks the spot. Earth is always indicated in astrology as a circle with an x in it. Life survived, despite all odds. Life, after numerous hardships that we can not imagine surviving, found a way. All the beauty of this planet nearly perished in one fateful tragedy not so long ago. All of the advanced civilizations of the past were wiped out in one, just one, fateful day. Our present day religious symbolism assures us that we have never quite forgotten it happened. We have never forgotten the nearly complete annihilation of our species. The fear that drives the Christians to accept Christ is a deep seated, long forgotten memory of this tragedy. The fear that drove the Aztecs and Phoenicians to sacrifice their own children was the fear of a repeat of this horrific event. It is a fear that has never left us because the reality is – the danger is ever present. The Giants, we like to call Nephylim, are the massive forces of nature such as celestial dynamics, magnetism, tidal waves and acceleration. An absence of vocabulary and misunderstanding both then and now, creates multiple gods. So we understand that what is portrayed in this small work of art was common knowledge among the Kings, Queens and High Priests which directed and paid for the art. The belief that this New Hampshire stone once belonged to a great personage can be concluded. It would have been meaningless to the commoner just as it is today to many. – It is not what is under the bed that is frightening, but what flies overhead. That innocent little spiral that stands alone so close to the bottom, is just a twirl. Is it innocent? We have seen it many, many times. It suggests revolution, infinity, turning, a whirlpool… Was it innocent? Or was it deadly? Was it so deadly that it takes a good understanding of engineering to grasp the how of it? What turned? How did it turn? Faster, slower, all around? Could it have turned? Something turned. What was the something? Or does it just mean the danger is all around us at all times, and is present still? Many pages of discussion on this subject can be found in future posts. The mechanics behind it from an engineering standpoint are explained in the paper: “A Planet Most Miraculous: The Mechanics of Earth’s Rotating Crust.” The what and how much is explained. But it is the ear of corn that tells us what turned and what happened. So, let us look at that plain old ear of corn. Corn and Shield View, Mystery Stone of New Hampshire, photo B. Freeborn, Pub Dom. It is an ear of corn, plain and simple. Most importantly it has been shucked. The rows run in vertical lines. The kernels run in orderly squares. Remember that little square purse the fierce spirit held so firmly with his big muscular arm in the Assyrian relief above? It is the same idea. So here is a quick riddle that repeats and repeats in all this ancient art. What meets at right angles, runs in rows, runs in columns, segments round objects like in pine cones or kernels in corn? And from the image of the tent we can add, what fans out from a central pole? Would an ear of corn not amply portray the concept of longitude and latitude to an intelligent scientific civilization, supposedly us, in the distant future? Given our knowledge base should we not be able to grasp that they are trying to convey the message that the impact of a comet turned the lines of longitude and latitude? Are they not saying that the planet was shucked like an ear of corn? But this is impossible!!! Not really. I give an explanation in the paper listed here: A Planet Most Miraculous. Top View with Corn, Tent and Dividers, Mystery Stone of New Hampshire, photo B. Freeborn, Pub Dom. We shall add credence to this interpretation. If you look at the stone from the top down, you see directly opposite to the corn is the tent. One represents longitude. One represents latitude. Between them is the central pole and the image of a gear. Longitude and latitude work together. The dividers are poised alongside to measure the change. We have discussed all the images except for the last circle with the funny images within it. We will close by returning to the face. This circle with the deer leg or arm thing seems like the artist was trying to draw a shield made out of pinto hide or he messed up. When the realization dawns as to what it is, opinion changes. This needs to be interpreted in two ways. In the first interpretation, it is an image of an arm raking and creating grooves with flames spouting out of mountains, and volcanoes in the upper part. It can also be seen as submerged land. This is the image of what happened after the impact of the comet. The planet was raked. It was exploding, and ripping. It was being destroyed. As the surface was shucked the crust folded in places and chasms gaped wide in other places. Where -oh- where was man during this assault upon the planet? There he is in the same image. It changes now. Now we can see it as an arm swimming through debris. We see animals in the water with him. They are drowning as the oceans rolled out of their basins. This is what would happen if the planet is disturbed. This was not a tidal wave here and there. It was all at once. All of it. Water. It sweeps up and out of ocean basins like a tipped bowl. It is a force that cannot be reckoned with or imagined. They are swimming. They are all in the water on a drowning world. The deluge is upon the world. And it rained for forty days and forty nights. New Hampshire Mystery Stone, B. Freeborn, Pub Dom. Now the image of the face reappears. It is a chilling, cold image. It is a man floating and dead in water. A silent face bobs upon the dark black surface. Sightless eyes stare into nothing. Mankind is gone. There is more to this story. I suggest that you not stop here. Future posts explain much more..
“We were a contemplative people who lived on a planet 7910 miles in diameter that turned at a fixed rate around a Sun of diameter 864,000 miles. And this place we called home. We measured our world and the heavens with rays of longitude. It was perfection. Our lives were complete until the day the meteorites came. And then the comets struck. We saw them coming. There were two which impacted with the planet, our home. Because of the impact the earth was shucked like an ear of corn. The planet was raked and burnt. The ground split asunder. The mountains spewed forth flames. The people and all that lived were engulfed by the oceans. Nothing was spared. The deluge was upon the land. We swam and swam and watched the animals drown. We swam and swam until we could not hold on. We all perished. Our homes, our peace, our happiness, our knowledge, all gone. We remember. We lament. We remember. We lament. The Old World/New World confluence always fascinates me. I hope their many mysteries can be solved. More power to you! Inukshook in northwestern BC, and the Arctic could very well be related to the MYSTERY Stones around the word. They certianly go back a long ways. I agree the art and stone are very similar. Are you interested in two astronomically-oriented long barrows I discovered in the Wallkill River Valley near Goshen, NY? They would go with the Stone Chambers dated by an obsidian dagger blade to 4,000 ybp in Horrigan and Imbrogno’s book, Celtic Mysteries (2000). I am sure the Neara Group would be very interested in knowing about it. Email one of them at their website. They are always looking for old sites and set up field trips to view them. Thanks for sharing. 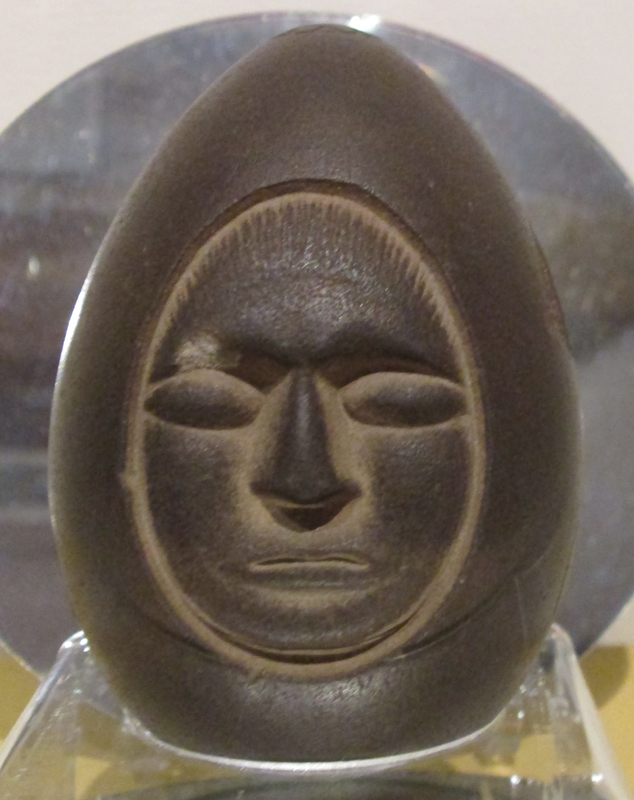 The face on this stone is similar to one found in Schuylkill county PA in 1968. Thanks for sharing. The image at the link is interesting. 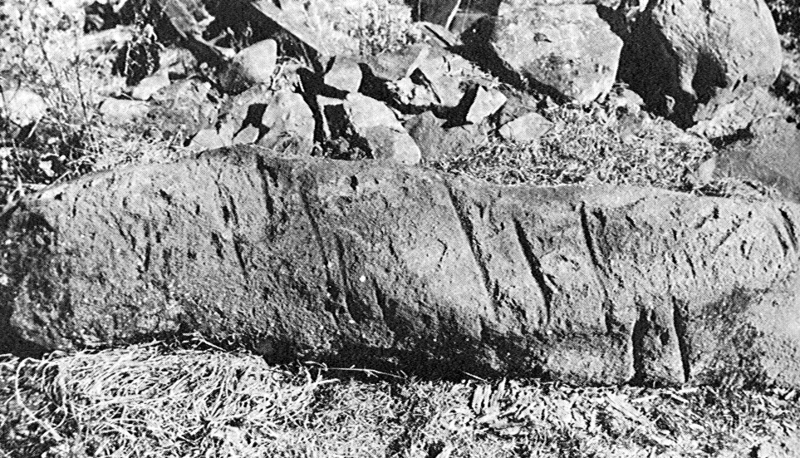 The New Hampshire Mystery Stone of Lake Winnipesaukee, as well as the Schuylkill County petroglyph clearly appear to be work of Celtic art as shown by the link below. The Pennsylvania petroglyph is an extremely rare find in this state.